Happy Independence Day. Though a bit late, I wanted to celebrate the special day with biryani as any occasion is celebrated back home. A festivity is not festive without a biryani and Malabar the region is synonymous with Biryani. Has anyone visited that area without at least once venturing out to eat biryani? Biryani is essentially a blend of rice and meat or fish with the rice cooked in the meat's juices to infuse the flavors in every bite. The traditional method of making the biryani is in a "chembu", a copper cooking vessel, specially shaped to have a wider bottom for the meat to cook well and a narrow top for the rice. The steam emanating from the gravy cooks the rice above, the lid sealed with dough to prevent the steam escaping. It is called the dum biryani elsewhere especially in Hyderabad. It’s a healthy and a very delicious way of making biryani. The aroma when the dough is broken and the seal lifted is the ultimate. Sunday at my grandmother's house was always biryani, and we used to wait impatiently for it, breaking and eating the dough crusts as it baked into a pretzel consistency. She would start the cooking at morning, getting everything ready...cut, hand ground, chopped until there was a colorful array of ingredients laid out and the lingering fragrance of fresh herbs. Over time, as convenience became our mantra, the meat and the rice started getting cooked separately, layered in baking pan and then baked together to get the flavors blended. I still make the biryani the separate way, but once in a while, the craving for the traditional takes over. On my last visit to Kerala, I gave up some clothes to make space in my suitcase for a small "biryani chembu". Even the time taken for the biryani seems less than the usual way. Don't worry if you don't have the chembu.. before that came , I was cooking it the steam (dum) way in any heavy bottom vessel such as the crock pot, or a hard anodized aluminum large sauce pan. So here is the recipe for the regular biryani.For those who want to try the dum version, the ingredients are the same and I shall soon post the detailed dum method. Lemon juice- 1 1/2 tsp or juice of 1 lemon. Dry roast all together and grind to a fine powder. 1. Clean the mutton and cut into medium sized pieces. Wash and drain. 2. Soak the fennel seeds and poppy seeds in a bowl with water for an hour at least and grind with very little water to a very fine paste. If it still feels grainy, add a tablespoon of grated coconut to grind it well. Keep aside. 3. Grind together the ginger, garlic and green chilies into a coarse paste. Chop the tomatoes into cubes and slice the onions. One onion should be sliced extra fine. This one is for the fried onion garnish. 4. Marinate the mutton with the ginger garlic chili, and all the other spices and ingredients except the onions, biryani masala and herb leaves. Add salt too and keep covered for an hour at least. Clean and soak rice for 10 minutes. Keep aside. 5. Heat three fourth of the ghee/oil in a heavy bottom pan. Add the garnish portion of the sliced onions and fry, till golden brown and crisp. Sprinkle some sugar over the onions to speed up the crisping. This should take about 10 minutes. Remove the onions and fry the cashew nuts on medium heat till it turns brown on all sides. Drain and remove. Add the raisins now and stir till they plump up. Remove onto paper towels. This ghee/oil is used for flavoring the rice so save it. 6. Heat up the remaining oil and add the rest of the sliced onions and sauté it till it becomes translucent. Add the marinated mutton, the poppy seed mixture, the biryani masala and the coriander, mint and curry leaves and mix thoroughly. Keep it covered and cook on medium heat for an hour, checking frequently till the oil starts to separate and the meat gets almost cooked but still has a bite left. If the mutton normally requires a long cooking time, you can pressure cook it for just one whistle and then simmer on slow heat to concentrate the gravy. Do not add water at all. Check taste and add more salt or yogurt, pepper etc if needed. 7. Preheat the oven to 200 degrees. 8. Heat 3 tbsp of the remaining onion ghee/oil and add the whole spices- cinnamon, cardamom, cloves and bay leaves. Sauté for a second and add the drained rice. Stir the rice till it turns opaque and add 6 cups water (three fourth of the quantity required for ghee rice). Cover and cook on slow heat the rice along with all spices and salt, till all the water is absorbed. This would take about 5-8 minutes. 9. In an oven proof dish, spread half of the mutton masala and place half of rice over it. Sprinkle some lemon juice to prevent the rice from sticking. Spread the remaining masala and top it with rice followed by lemon juice. Pour 2 tbsp of ghee/oil on top of it and sprinkle some roasted onion, nuts and raisins. Close it with a layer of aluminum foil and then lid and put it in the oven for 25 - 35 minutes. Remove and let rest for another 5-10 minutes before opening. 10. Serve with coconut chutney (biryani chammandi), Pickled onions (Ulli surka), Yogurt and Papadam. P.S. The biryani masala freezes extremely well, so if you have extra masala, separate it after cooking and freeze it immediately. Defrost and make ghee rice to go with it and you have instant biryani. Revathi's instant biryani which is a must try when you want biryani,but have no time. Had been to Kozhikkode many times and had the biriyani from there. I have been looking all over the place for a typical kozhikodan biriyani. Thank you so much for the recipe! I just chanced upon your blog now..planning to read all your posts. Excellent job Shaheen,a plate of biriyani is an all time special meal. thank you for your recipe. Hope you will post your Ulli surka and biriyani chammanti recipes sometime. Shaheen, You really rock. What a mouth watering delicious picture...hmmm....I'm drooling right now....Who doesn't love biryani right? It's always a special dish for special occassions. I'm planning to prepare this dish for my hubby's b'day this month....so thanks for sharing this wonderful biryani. Btw, is chicken Biryani also prepared the same way with same quantity of spices....? why I'm asking is I've never bought mutton, so I've no clue abt that. My mom makes mutton curry and mutton varatiyadhu. I know to eat that very well....but I've no clue abt buying mutton here in U.S....when I go to the market , there are so many varieties like lamb ribs etc etc....I don't know which one to buy. thanks again for this awesome recipe. Oh shaheen we both seem to be celebrating independence with a thump,me with my chicken biriyani and you now with your mutton biriyani..Let the flavours of Malabar spread everywhere! !Ulli Surka,you meant just onion,tomato and green chilli in vinegar, right?...that's what we generally do at home if not for the onion raita. Thanks for all ur comments, archana, pushpa and annita, it is really appreciated. Shynee, i haven't tried adding tomato to the ulli surka. thats interesting. normally its just ulli and pachamulaku. I am going to link ur biryani to this. Rg, i buy mutton from the halal shop.check for muslim business in ur area.if u know how to eat, u should learn how to make. :)or u could try with beef. or for chicken, till i post it,he he... u could try shynee's chicken biryani. inji, u caught my laziness. i was supposed to post the dum biryani and then got fed up trying to make the snaps align properly. will do so ur comment on posts duly noted. Oh wow! I can almost tatse this in my mouth. First time here Shaheen and you have an amazing blog. Have bookmarked it! I love biryani, but because of all the work involved I kind of get discouraged. wish i was living near you though. Then Id kind of invite myself when you make it! LOL! My hubby is from calicut and keeps talking about the biryani there. So, i did try making this 2 yrs back - it's been the family joke since then:). Well!!! thanks to you i have managed to redeem myself. the proportions and the cooking time mentioned are extremly precise. awesome recipe. waiting for the chicken version of the same. 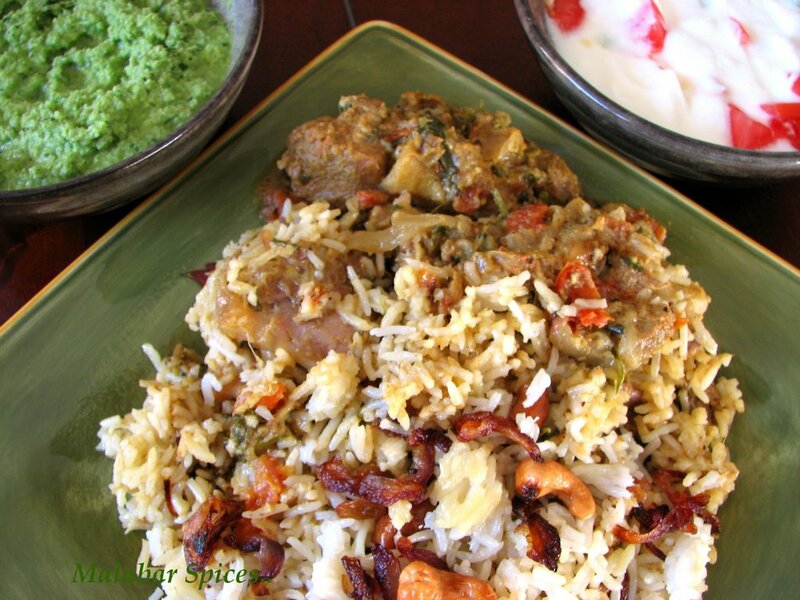 Shaheen thatha, I cooked the beef version of this biriyani and coconut chutney. Turned out to be good and helped a bit to overcome my home sickness. Nishad tasted the coconut chutney and said that it tastes like velimma's chamandi :). Now I can call Umma and proclaim that I too can cook biriyani. It brings me the memories of Hiliya Resort. While we were there during our last vacation we had the opportunity to taste Calicut Mutton Biriyani, that too home made from fresh organic farm spices and rise from Hiliya organic farm surrounding the Resort in Wayanad. We tried your recipe and it turned out great and I even saw my hubby bookmarked the recipe. Hi Shaheen, Sri here. We were looking for soemthing to cook with Cauliflower and peas, without masala and thats when we hit upon the idea to look at your blog. Very nice to see what you have been creating here for fod lovers. Very creative. How about adding a section for people who are shakaharis like us????? Do u have any sugestions as to how much mutton and rice is required for 40 people?...plz come out with more recipes. Dont we need to use chilli powder??? anon, no we don't need chili powder. the hot green chilies are sufficient. It's really great ...I agree with mot others omment??? WOW!! I tried ... it was awesome. I am big fan of calicut/tellicherry biryani. I had tried Ummi Abdulla's mutton biryani before...it was really good. I tried your's recently and it came out even better!! It was fantastic! Thanks to you we could enjoy this mouthwatering biryani..thanks a lot! I am shameena from Abu Dhabi.Recently i visited this blog while searching for something different for ifthar. last week i prepared this mutton biriyani for 25 people.it was the best biriyani we ever made.all my guests admired. The same thing we made for EID. and tomorrow also i have some guests,my husband want the same thing to be made. we wont get Khus Khus in UAE.Instead i used some cashews. Your biriyani looks very overcooked. The rice has to be seperate each other.Next time try to keep the biriyani in the oven for 45 minutes.(350). The portion of the biryani photographed is with the masala and hence looks overcooked. I assure it can't get overcooked at that temp in the oven. Please send me a photo of your biryani to compare if i am wrong. your biryani looks absolutely mouthwatering! i'm vegetarian and i really want to try your recipe--i'm somewhat familiar with vegetable biryani and i'm wondering if i'll need to adjust the recipe? please help! thanks so much!! your biriyani recipe is super..adipoli as they say in malayalm..Thank you.My hubby liked it a lot. Mutton briyani looks great! First time here.. Will follow ur posts..! Do check mine..! I tried this recipe as per your measurement except 2 masala ingredients like nutmeg. Came out very well and we really enjoyed the biriyani. Thanks anyway for sharing the detailed recipe. in this recipe no coriander powder is added. Can you confirm whether in malabar biryani it is never included? is the taste better with the inclusion of coriand powder Your description is awsome. rajesh.. i don't add coriander in this recipe. u could add maybe 1/2 or 1 teaspoon if you want..sometimes its added. no such thing that its not added in malabar side.. each to his own taste. Thanks Shaheen. Since you have illustrated 2 different types of preparation (pakki and with raw marinade), which preparation is better when you compare the outcomes as per your opinion? just wanted to know if the entire Biryani Masala that has been grinded is used or is there any propotion?? I have a clarification as for the Biryani Masala, do you use the entire Masala powder that as been grounded or is their a measurement of the same that has to be used. Just wanted a small clarification regarding the Biryani Masala. Do we use the entire masala powder or is there a particular measurement?